Ricky “Harris” Gibson, 29, of Hattiesburg, MS, passed away at his home in Auburn, AL, Sunday, November 25, 2018. 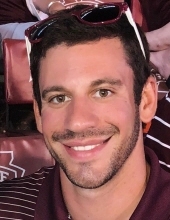 Visitation will be Friday, November 30, 2018 from 10 – 11 a.m. at Parkway Heights United Methodist Church with services immediately following at 11 a.m.
Harris graduated from Oak Grove High School in 2007, attended Mississippi State University, and received his Bachelor’s Degree from the University of Southern Mississippi in 2014. He was a History teacher and football coach at Lyman Ward Military Academy in Camp Hill, AL. He was preceded in death by his grandfathers, Jimmie H. Thrash and E. Stanley Gibson; and his grandmother, Frances C. Hull. He is survived by his parents, Ricky and Nancy Gibson of Hattiesburg; his sister and brother-in-law, Amanda and Chase Blankenship of Hattiesburg; two nephews, Jack and Luke Blankenship; one grandmother, Doris Walker Thrash of Hattiesburg; and numerous aunts, uncles, and cousins. In lieu of flowers, the family ask that you make a charitable donation in Harris’s memory to Homes of Hope for Children. To send flowers or a remembrance gift to the family of Ricky "Harris" Gibson, please visit our Tribute Store. "Email Address" would like to share the life celebration of Ricky "Harris" Gibson. Click on the "link" to go to share a favorite memory or leave a condolence message for the family.